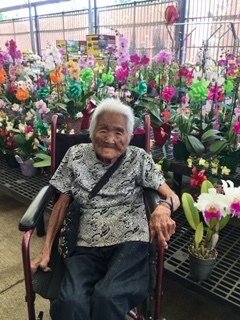 Miyuki Maehata, 96, of Kapaa passed away on January 10, 2019. She was born in Lihue, Hawaii on October 29, 1922 and worked as a cook at Fairway Restaurant. She was preceded in death by her husband, Masaharu Maehata; daughter, Yumiko Johnson; sister, Haruko Francisco; brothers, Ismo and Yoshi Matsuyama. Miyuki is survived by her son, Mark Maehata; daughters, Lisa M. Nakamura and Kay Mizumoto; 5 grandchildren and 14 great-grandchildren. Services will be held at Kapaa Hongwanji Mission on Sunday, January 27, 2019 with services beginning at 4:30 p.m.